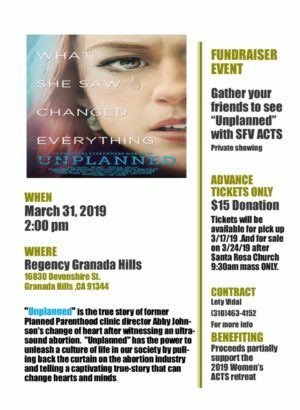 Our SFV ACTS Community will be getting together for an ACTS Fundraiser this Sunday, March 31 to see the screening of the movie Unplanned, the true story of Abby Johnson's journey from working as the director of a Planned Parenthood facility to working for the Coalition for Life. If you want to join us contact Lety Vidal at (310)463-4152 to purchase a ticket. If you already have your ticket be sure to arrive to the movie theatre by 1:15 P.M. to have opportunity to mingle with ACTS Brothers and Sisters, take pictures at our special ACTS backdrop, and to buy your popcorn in time for the screening! We thank you for supporting this movie and our upcoming ACTS Retreat.